The prices shown are retail (keystone). so that many items must be custom ordered from Nepal and might not be in our current stock. Please contact us to determine which items are immediately available and which items would be specially made for you in Nepal. The market is volatile. All prices are subject to change without notice. We will inform you of changes before filling your order. Please call or write if you have questions about the wholesale pricing, 301-587-0871, aworldofgood@gmail.com. New Styles are throughout the page. Beacause of the high silver prices, we are not keeping many of the larger silver beads in stock, but please ask if you would like us to order them for you. We will have to get you a current quote for ordered items. Malas as well as pewter, brass, and copper pendants can be found at the bottom of the Himalayan Cultural Crafts Page. 3.5 cm long, 2.1 cm wide and 1.2 cm thick. This bead really is in the shape of a flying saucer! See the newest brass beads at the bottom! We are now making many of our hand carved artisan beads in pewter, brass and copper. Each bead is listed indicating the material and priced accordingly. Please ask if you would like to place a special order in a specific metal. FYI: Many bead buyers have grown accustomed to calling any interesting silver beads "Bali Beads." Today, many "Bali Beads" actually come to the USA from India rather than Bali. We are one of the few wholesale importers of these distinctive Nepalese beads in the USA. Several of the beads are our original designs. They are hand built in processes very different from those used in making "Bali Beads." Most of what you see are beads that have been hand built and carved one at at time. 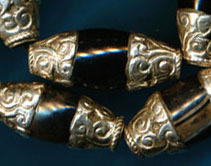 Brass beads can be made in silver or silver plate. Currently Silver Prices are too high to keep a large supply of silver beads in stock. We can order most of these beads for you, but it will take about two months to get them. Large Coral with carved silver sides. Each of these is unique with different Tibetan symbols carved on either side, approximately 4.5 cm in length. What is this stuff made of? It depends on the beads. If the color is smooth and shiny, it is a resin. It is very similar to enamel work. If it looks like little crushed stones then it is dyed stone set in a kind of epoxy. There is a turquoise colored stone called magnesite which has little black veins in it. These days, many people call it 'New Chinese turquoise.' It is not turquoise but a naturally white stone that can be dyed easily. We also carry sterling silver, real coral and real turquoise. The priceswill be higher for these items, Please ask if you are not sure what the materials are. Square Filigree Lapis and Turq. Cylindrical Floral Brass, 2.6 cm. Currently available in Coral only.